The blue Chihuahua is certainly an Instagram star waiting to be born, but how does this tiny dog compare to others? The blue Chihuahua has the looks, but how does it stack up in terms of health and behavior? In this article, we’ll discuss how blue Chihuahuas get their color and how that affects their overall health and temperament. The “blue” coloring of a Chihuahua is really more of a gray than an actual blue. Blue coated Chihuahuas are sometimes thought of as rare. In fact, the inheritance of coat color is well understood. 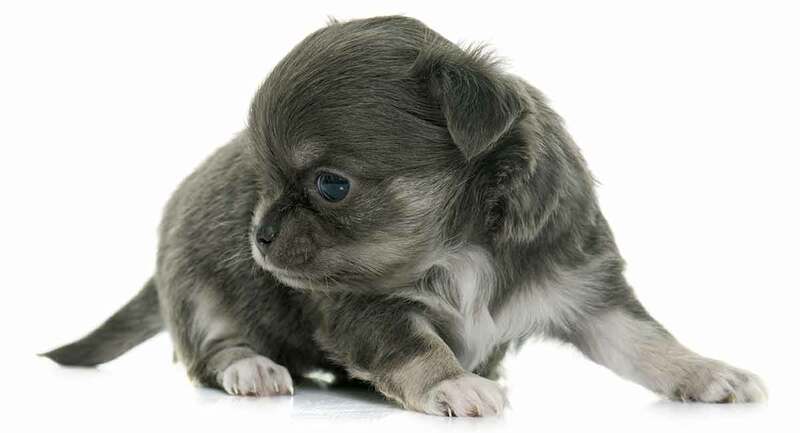 Knowledgeable breeders can produce litters including blue Chihuahua puppies fairly easily. However, for breeders who truly love Chihuahuas, their top priority is preserving all the best qualities and welfare of the breed. Coat color is usually a secondary concern, after matching two healthy, completely unrelated parent dogs. When choosing a sire comes down to color, then the frequency of blue litters will depend on breeders’ personal tastes, and perhaps the demand from hopeful dog owners. Blue coloring is the result of a homozygous recessive genotype, typically denoted as dd. If that sounds a little cryptic, don’t worry. In this context, “d” stands for “dilute”, or “dilute gene”. The dilute gene changes the appearance of coat color, by making it more faded and pale – literally diluting the pigment in each strand of fur. Homozygous recessive means the dilute gene only works when a puppy inherits it from both mom and dad. Hence the genotype dd – two copies of the dilute gene! When the dilute gene works, it modulates the appearance of another color. In the case of the blue Chihuahua, the other genetic instruction they carry for coat color says “be black!”. But when the dilute gene reduces the amount of black pigment being produced, and what remains takes on an ethereal blue appearance instead. But when you get a blue Chihuahua, are you getting more than just striking coat? These pint sized pets have been raised as companion dogs for hundreds of years. They have an innate craving for human attention and interaction, which makes them loyal and sweet lap dogs who live for affection. The best way to get a sense of what a blue Chihuahua puppy will be like in terms of personality is to spend time interacting with their parents. Even though they’re small, it’s important not to overlook socialising and training from an early age. Since a small dog can easily be scooped out of unfamiliar situations, it’s tempting to rely on doing so, rather than investing lots of time and energy in positive socialisation experiences from a young age. However, this can result result in a grown up dog who’s afraid of new people and unfamiliar places, and is quick to bark and snap out of fear. This is just as true of blue Chihuahuas as all other colors. Ask about how your puppy will be raised before they come home with you. Nurture strongly influences a dog’s personality. Next let’s look at whether a blue Chihuahua’s special genetic make up has any physical effects beyond the colour of their fur. Patella luxation – around 1 in 20 Chihuahuas are affected by loose knee joints, which dislocate easily. Dental problems – despite their tiny scale, Chihuahuas have the same number of teeth as all other dogs. This makes them prone to overcrowding and decay. Joint disorders – Chihuahuas are prone to hereditary degenerative joint disorders affecting their hips and elbows, which can progress to painful arthritis and lameness. Hydrocephalus – a genetic disorder characterized by increased fluid inside the skull, and reduced brain tissue. Hereditary eye disorders – and in particular vitreous degeneration, where the gel inside the eye liquefies, leading to blindness. Tracheal collapse – collapsed windpipe caused by weakening of the cartilage rings which should hold it open. In addition, there are some ailments which particularly affect blue Chihuahuas. Let’s look at them next. Color dilution alopecia (CDA) affects the coat and sometimes skin of a dog. Initially the coat may become dull or thin, and eventually, the dog may suffer from hair loss and poor regrowth. Hairless skin can be scaly and more susceptible to infection. Diluted dogs have a higher risk of developing CDA, but researchers haven’t yet pinpointed why. Though researchers don’t know exactly which genes are responsible for alopecia, they do know that certain mutations which cause dilution may have something to do with it. One such mutation is known as MLPH c.-22G.A SNP, and though it doesn’t seem to be solely responsible for CDA, researchers believe that it must be present along with other yet unknown factors for CDA to occur. A more recent study, published in January 2018, has found another mutation that causes dilution. It is referred to as MLPH:c.705G>C and is responsible for dilution in dogs that do not carry MLPH c.-22G.A SNP. However, there is not much research about whether or not this newly found mutation affects CDA. When people think of blue Chihuahuas they may also be thinking of blue merle Chihuahuas. Interestingly, not all blue merle Chihuahuas have the dd genotype we learned about earlier. Just like dilution genes, merle genes also modify other genes and create different areas of dilution while leaving patches of color. In some blue merle Chihuahuas, the merle gene acts upon black pigment and results in a dog that has grey colored fur (much similar to the blue Chihuahua) with black patches. Dilute blue merle Chihuahuas exist as well. These dogs do have the dd genotype. Their fur is light gray, with darker blue patches. The merle pattern is very attractive, but the merle gene is a double-edged sword. When a dog carries one copy of the gene, they inherit a merle coat, with a low frequency of side effects. But if they inherit the merle gene from both parents – known as being double merle – they have a greatly increased risk of suffering serious eye and ear defects. One such defect is microphthalmia, when an eyeball is smaller than it should be. Another is microcornea, when the cornea is smaller than it should be. These defects can cause double merle dogs to be fully or partially blind. Fortunately there are health tests available to breeders that help determine a dog’s likelihood of passing health issues to their offspring. DNA tests can identify if a dog possesses the merle gene. If you’re interested in purchasing a blue merle Chihuahua, ask the breeder about both health tests and DNA tests. Some dogs can actually carry the merle trait without expressing it. Good breeders are diligent to avoid mating two dogs who both might both carry the merle gene and pass it on to their puppies. This ensures they produce only healthy dogs. In many respects, blue Chihuahuas are just like all other Chihuahuas. However, due to their coloring, they are at an increased risk for color dilution alopecia. If you are particularly interested in bringing home a blue merle Chihuahua, take extra steps to make sure your breeder understands the inheritance and potential repercussions of the merle gene. Though blue Chihuahuas are very sweet with their owners, it’s important to make sure they grow up confident and well behaved around other people and dogs as well. Is your blue Chihuahua beautiful inside and out? Tell us about them in the comments box below! Esson, Clinical Atlas of Canine and Feline Ophthalmic Disease, 2015. Kim et al. “Color-dilution alopecia in dogs,” Journal of Veterinary Science, 2005. Pérez-Guisado, et al. “Heritability of Dominant–aggressive Behaviour in English Cocker Spaniels,” Applied Animal Behaviour Science, 2006. Przyborowska et al. “Hydrocephalus in dogs: a review.” Veterinární Medicína, 2013. Strain, “The Genetics of Deafness in Domestic Animals,” Frontiers in Veterinary Science, 2015. Welle, “MLPH Genotype—Melanin Phenotype Correlation in Dilute Dogs.” The Journal of Heredity, 2009. Cavanagh & Bell, Veterinary Medical Guide to Dog and Cat Breeds, 2012.